Published: Feb. 12, 2013 at 02:56 p.m. 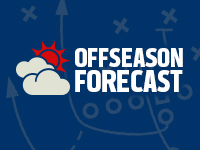 Updated: March 3, 2013 at 03:13 p.m.
With the offseason officially under way, Around the League will examine what's next for all 32 teams. The series continues with the Super Bowl XLVII champion Baltimore Ravens. Ravens coach John Harbaugh made his biggest move during last season. Offensive coordinator Jim Caldwell will be back for his first full season calling plays after taking over the offense in Week 15. Linebacker Ray Lewis' retirement is just one big change to a roster in major transition for 2013. » Joe Flacco, quarterback: Flacco agreed to a monster contract that will pay him in the neighborhood of $120 million over six years. Flacco will sign the deal on Monday. He bet on himself last August, and now it's the Super Bowl MVP's time to cash in. » Dannell Ellerbe, linebacker: Lewis' retirement makes Ellerbe that much more valuable. He can do a little bit of everything, and do it well. He's probably the team's top priority after Flacco. » Bryant McKinnie, tackle: He might have been one of the five most valuable players on the team during the playoffs. But do the Ravens trust him to keep the weight off? » Paul Kruger, linebacker: The Ravens probably can't afford to keep their best pass rusher from 2011. Other key free agents: Cornerback Cary Williams, defensive tackle Ma'ake Kemoeatu, defensive tackle Ryan McBean. 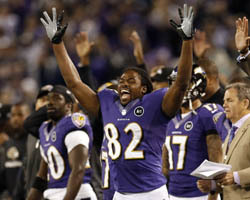 Take a look at the best photos from the 2012 Baltimore Ravens season. More than anything, the Ravens need salary-cap space. They will have a hard time retaining their free agents, much less adding new ones, so don't expect anything but bargain shopping before the NFL draft. The most pressing concerns come on defense. Both the safety and cornerback positions are thin and could lose starters. The Ravens lack pass rushers (although a healthy Terrell Suggs will make a huge difference), and Haloti Ngata needs help on the defensive line. The depth at wide receiver also could be improved. General manager Ozzie Newsome made it clear the Ravens will not try to keep the band together at the expense of future financial pain, so it's safe to expect a lot of the names above to fly the coop. A new Flacco contract should happen, but he might miss some offseason work before that happens. Look for Kruger and Williams to find deals elsewhere. Wide receiver Anquan Boldin should stay, possibly on a reduced contract. A new long-term deal for tackle Michael Oher or restricted free-agent tight end Dennis Pitta makes sense. Newsome's comments indicate he won't be sentimental. That's why I think Reed will be wearing another uniform in 2013.